Heather Watson upset compatriot Elena Baltacha at the Aegon Classic, overcoming the domestic number two 7-6 (7-5) 6-3 in their all-British clash. The 20-year-old British number three continually piled pressure on Baltacha's serve, breaking her higher-ranked opponent five times. Earlier in the day Baltacha had scraped past Taiwanese Kai-Chen Chang 4-6 6-4 7-5, after resuming 4-6 3-2 down. 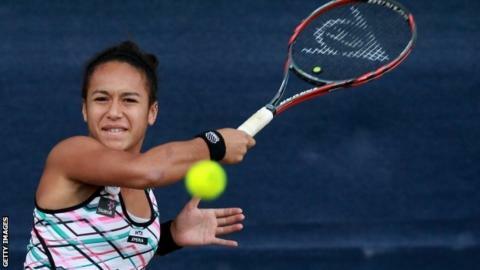 Anne Keothavong, Laura Robson and Mel South were all beaten in Birmingham. It was the first time Baltacha had lost to a British opponent in four years. The 15th seed led 4-1 in the first set when the players were forced off by rain but when they returned Watson was a different player, battling back to take the first set on a tie-break. The youngster, who came through qualifying to reach the second round of this year's French Open, then broke Baltacha three times in the second set. "I had a rough start to the year," said Watson, who lost her first four WTA Tour matches of the season. "And it's made me appreciate going onto the court and having the opportunity and taking it when I have it. "I'm using it to learn and get stronger." Watson will face Italy's Roberta Vinci on Centre Court on Thursday before joining forces with Robson in the doubles to take on Timea Babos and Su-wei Hsieh. Keothavong, who took over from Baltacha as British number one last week, was unable to sustain the form that saw her beat 12th seed Tamira Paszek in the first round., as she went down 6-3 6-4 to Zheng Jie. The 28-year-old broke her opponent twice in their 81-minute match but was broken three times in the second set by the 2008 Wimbledon semi-finalist. Guernsey's Watson is the only remaining home player in the draw after defeats for the three other Britons in action. Laura Robson fought hard but was eventually overwhelmed by ninth seed Marina Erakovic 6-4 3-6 6-4 in a shade under two hours. Mel South fell to former world number one Jelena Jankovic as a gritty second-set showing ended in 6-1 7-6 (7-3) defeat. South, ranked sixth domestically, had two set points to take the match to a decider, but was undone in the tie-break. Jankovic, 22nd in the world, will now play Casey Dellacqua after she beat British number seven Tara Moore 4-6 6-4 6-1. The top two seeds - Italy's Francesca Schiavone and Germany's Sabine Lisicki - both lost their opening matches. Schiavone, a clay-court specialist, was edged out 7-5 6-4 by Japan's Misaki Doi, while Sabine Lisicki, who enjoyed a surprise run to the semi-finals last year at Wimbledon, was overcome 6-3 6-4 by Poland's Urszula Radwanska.